As modern society develops, residents are looking for more advanced features in their intercom systems. However, old apartment buildings often do not have data network wiring in place to install an IP-based intercom system. The cost associated with rewiring has become a barrier in many intercom system upgrade projects. The Dahua 2-Wire Apartment Video Intercom System provides a cost-effective, fast, simple, and convenient way to upgrade analogue intercom systems. Simple wiring: The VTNS1006A-2 switch and the VTH5222CH indoor unit use a two-wire interface. The switch is connected to the indoor unit using any two wires, which are used for signal transmission and power. There is no polarity and the switch has a network interface to connect with external networks and communicate with IP devices. The maximum supported distance between the switch and the device is 100 metres, while the maximum supported distance between switches is 30 metres. 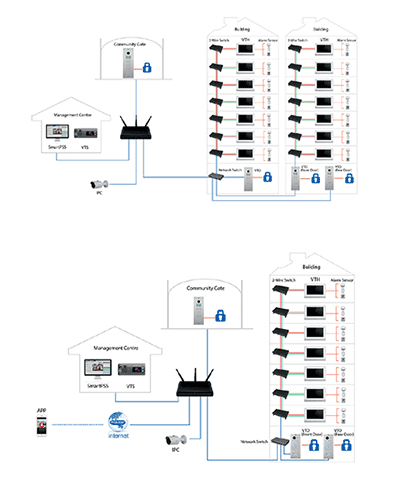 Large estates: With the VTO1210C-X large apartment outdoor station, each unit can support a maximum of 20 outdoor stations and 1000 indoor monitors. Each switch can support a maximum of six indoor monitors and only two series connections are needed between switches. The maximum number of switch connections is 30 and can satisfy the requirements for high-rise apartments. Answer anywhere: Each household can install a maximum of five VTH5222CH indoor monitors which can be used for group calls, and calls can be answered anywhere within the household; within the household, users may communicate with each other through the indoor monitors. Smart PSS management: SmartPSS is software that can be downloaded from the official website. It is convenient and facilitates smart management of entire areas.